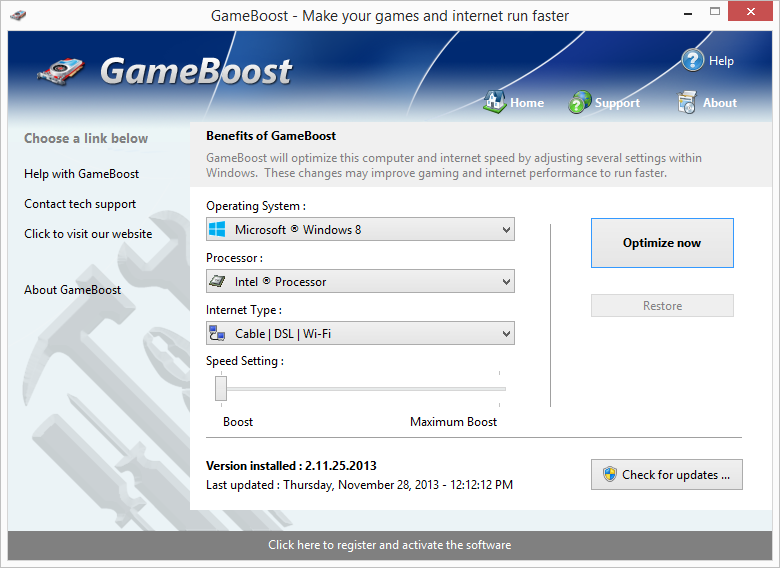 GameBoost sets the standard for PC gaming and internet optimization software. GameBoost instantly increases the performance of your computer and squeezes out every last bit of performance your computer and internet connection is capable of. With many of the latest PC games requiring high hardware requirements to have a suitable gaming experience, it is important to optimize your computer's performance. Windows is a general operating system which is used for many tasks; it is not optimized for gaming. With GameBoost and a few clicks of your mouse, you will notice an increase in frames per second, smooth game play and less latency and lag during multiplayer gaming. GameBoost makes several Windows registry and system changes to increase the performance of your current gaming hardware; this allows you to play the most recent games without having to spend hundreds of dollars to upgrade your hardware. These changes made to your computer improve memory usage, how foreground applications are prioritized with the CPU, hard drive access read and write speeds, how fast graphics can display on your screen, the overall speed of your internet connection and latency. GameBoost does not make changes, no patches and no modifications to games themselves, thus no anti-cheat detection software considers our software cheating software and you will not be banned from those gaming networks. GameBoost also improves the speed of your internet connection; these system changes work with all internet connections such as Cable, DSL, U-Verse, Fios and dial-up. If you notice during multiplayer gaming that you are getting long pings and lag, GameBoost can help improve the speed of your connection. GameBoost makes several Windows registry changes to improve how networking packets are transmitted and received, we increase the buffer sizes which allows data to be transmitted and processed faster on your computer, allowing games and downloading files to work much faster. Changes: Removed TrialPay option on uninstall of the software as TrialPay is no longer available. For so long as the Software is the most current version of GameBoost distributed by PGWARE, you may give exact copies of the evaluation Software to anyone. You may not charge any fee for the copy or use of the evaluation Software itself, but you may charge a distribution fee that is reasonably related to any cost you incur distributing the evaluation Software (e.g. packaging). You must not represent in any way that you are selling the Software itself. Your distribution of the evaluation Software will not entitle you to any compensation from PGWARE. You must distribute a copy of this license with any copy of the Software and anyone to whom you distribute the Software is subject to this license. You may not remove any copyright, trademark or reservation of rights language displayed on, in or with the Software. You may also not include any registration number, serials or methods to circumvent the Software protection mechanism. See Product Documentation/Installation For License Agreement.